If you are starting a company in global fast-paced markets where the competition will be coming from everywhere, or even harder, transforming a long-existing company that is now facing global competition, you need to read this. In the last few years globalisation increased the pace of innovation in most markets. Hence, predicting future consumer behaviours with traditional market research tools and techniques is not only difficult, it is now nearly impossible. The yearly market study, based on historical data, has long been the tool on which a large portion of the important decisions have been based on. Although still useful to get an overall picture on your industry, historical data is not suited for the important decision making job in fast-paced markets that are highly competitive. In order to make quick, pertinent decisions efficiently, you need a different type of information. Given there are many ocean’s worth of information out there, you need to know which information to focus on to ensure you are at the top of your decision-making game. Traditionally the first thing one did when doing a market research was to ‘’size the market’’. You’d go to your local library and find census data to identify how many people (or companies) fit in your customer segments. This data was anywhere from one to 5 years old. Then you’d look at the socio-demographic variables and consumption habits attached to this segment. This data was usually at least 2 to 3 years old. Even when paying big money for market studies done by the big market research firms, you still get information that is, at the very best, 9-12 months old. This outdate information can send you in a hard concrete wall when you launch products/services that are already outdated when they hit the market. In fast-paced markets this is an almost certain kiss of death; one that will have you spinning and spending all your (and often borrowed) resources, including time and energy, until none are left. It sounds trite but irrelevant market data, which used to be a small nuisance, can now paralyse a company’s decision making process or at the very least slow it down significantly. Thanks to the internet, the proliferation of market data applications, tools and connected objects, the amount of market information available is mind boggling. Hence taking the time (and having the expertise) so only (or almost only) relevant data comes in from your pipelines is essential. This is not a one-size-fits-all proposition. Different organisations will need to focus on different types of information. With this in mind, I’ll elaborate on two of the most common types of information needed to make daily decisions in fast-paced markets. You need to collect this information throughout your customers’ lifecycle. The following table will give you an idea of the various techniques/tools used to gather this information at each stage. In fast-paced markets one of the best predictor of change in customer behaviour (and often future revenue decline) is new innovative competitors in the market. These innovators will bring more efficient technologies, new processes, and better/different value propositions in the market, most often at an equal or cheaper price. These are all heavy influencers of customer behaviours. Ideally, you would want to know what competitors are coming into your market before they get there. This isn’t always possible but the investment made (not necessarily very big) to keep as informed as possible will yield some of your most useful market information. Don’t forget, your competition is global so extend your search to countries where competitors are most likely to come from. Gathering the right information is not enough of course. You need to make it useful for decision-making purposes. Each of these steps is the subject of a multitude of books and graduate university programs. Many of these steps require different tools, processes and expertise. The task is daunting for certain. In turbulent markets, it is unfortunately essential for your organisation’s survival. As I often tell entrepreneurs I work with the only way to eat an elephant is to start with the first bite. If you’re building a sky-scraper, you won’t start digging a hole with a shovel. You’ll get the equipment, expertise to run that equipment and (implied) processes that make you as efficient as possible to dig the hole. What you won’t do however is to rent every single tool and piece of equipment you need for the entire project on day 1. Hence, when you are starting your company or re-inventing it, you’ll need to not only get the right tools, expertise and processes in place to act quickly but also do it in the right sequence and get your timing right. Just in time is the way to go on this one. Again, there is no recipe or one size-fits-all tool that will answer your needs. You’ll initially need to dig around and look for applications that will help you do whatever tasks you need to accomplish to set your market information based decision system. There will be trials, errors and some frustrations along the way. You will become intimately familiar with the term API. Eventually, when the time is right (and it makes financial sense), you’ll migrate towards large integrated software solutions and experience a different set of frustrations. There are no ‘’nothing but blue sky’’ solutions to do this that I know of. I would also be very weary of anyone trying to sell me one. Organisations, big and small, have traditionally based their important decisions on market studies (I should know I have done hundreds of them). These market studies are no longer the right management tools to keep your competitive edge in fast-paced markets. 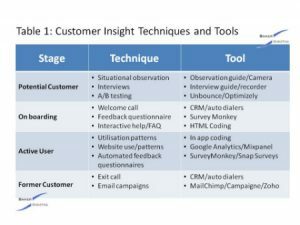 Market research and information management tools that allow you to acquire and maintain constant intimate knowledge of your customers (current and potential) are now essential to making the right decisions for your organisation. Fast-paced markets that are global and highly competitive require a different type of information, a different approach and different decision making tools in order to make timely decisions. Fast-paced markets require fast-paced decision making ability. Do you have the right tools, processes and competences in your organisation to enable this? Application programming interface: A string of software code that enable two applications to communicate with each other.